To be held at the Mitchell Administration Centre on 28 September 2011. Council held a Special Meeting for the purpose of considering and adopting the 2011/12 Budget for the Maranoa Regional Council in accordance with Section 104 of the Local Government Act 2009 and Section 100 of the Local Government (Finance, Plans and Reporting) Regulation 2010. The minutes of that meeting are now presented for confirmation. Local Government (finance, Plans and Reporting) Regulation 2010 Sections 11, 14, 15, 28, 33,35, 41, 50, 52, 64,67, 100,122, 133, 134 & 155. Setting of the Budget for all activities undertaken by Council for the 2011/2012 budget period. Mayor Cr. R S Loughnan chaired the meeting with, Deputy Mayor Cr. T G Hartley, Cr. J P Bartels, Cr. J L Chambers, Cr. R J Denton, Cr. W M Newman, Cr. M L Price, Cr. W S Wason, Cr. J S Watson, Chief Executive Officer – Paul Bawden, Director Community Services – Tony Klein, Director Corporate Services – Matthew McGoldrick, Director Planning & Environment – Rob Hayward, Acting Director Operations – Stephen Mow, Planning & Environment Support Officer – Jessica Reiser, Corporate Communications Officer – Jane Frith, and Kelly Rogers Minutes Officer in attendance. The Mayor welcomed all present and declared the meeting open at 9.17AM. 2011/12 Budget for the Maranoa Regional Council in accordance with Section 104 of the Local Government Act 2009 and Section 100 of the Local Government (Finance, Plans and Reporting) Regulation 2010. That Council adopt the 2011/12 Operational Plan as presented in accordance with Section 122 of the Local Government (Finance, Plans and Reporting) Regulation 2010. That Council adopt the Revenue Policy as presented in accordance with Section 134 of the Local Government (Finance, Plans and Reporting) Regulation 2010. That Council receive the 2011/12 Budget Report and ten year Financial Plan as submitted. That Council categorise rateable land for the purposes of establishing a differential rating system in accordance with Section 15 of the Local Government (Finance, Plans and Reporting) Regulation 2010. The valuation of the Maranoa Region effective as at 30 June, 2011 would lead to perceived rating inequities and a distortion of relativities in the amount of rates paid in various parts of the Region if only one general rate was adopted. Council has identified twenty-six categories of land. These have been identified on the basis of distinct urban areas and rural areas situated within the Maranoa Regional Council and categories for extractive industries, mineral processing petroleum leases, refineries, rural residential and large home sites, shopping centre, share bore sites, stock/domestic bores, not for profit sporting clubs, transformers rural and Yellowbank Junction. In accordance with Section 22 of the Local Government (Finance, Plans and Reporting) Regulation 2010 owners of rateable land will be informed that they have the right of objection to the category their land is included in. All objections shall be directed to the Chief Executive Officer, Maranoa Regional Council and the only basis for objection shall be that at the date of issue of the rate notice having regard to the criteria adopted by Council, the land should be in another category. Land used for rural purposes having an area of 80 hectares or less and land with a primary land use code 4 or 5; or other land having an area of 80 hectares or less not used for purposes described in the criteria for any other category. That a Minimum General Rates be levied on all rateable land within the Maranoa Regional Council as stipulated above for the 2011/12 financial year in accordance with Section 11 of the Local Government (Finance, Plans and Reporting) Regulation 2010. The following limitation of increases will apply in accordance with Section 50 of the Local Government (Finance, Plans and Reporting) Regulation 2010. That Council makes water charges for 2011/12 financial year on the bases set out below to be levied on all land within the Maranoa Regional Council whether vacant or occupied to which Council is prepared to supply water, together with any land already connected to the Council water supply system. The charges are also made on the specified bases in respect of any class of land or other structure, a particular structure or a particular parcel of land which water is supplied that is not rateable under Section 33 of the Local Government (Finance, Plans and Reporting) Regulation 2010. All such charges levied shall be used to defray the cost of constructing the water supply facilities including the payment of interest, depreciation and the costs associated with the operation, maintenance and management of the water supply system. The basis of the water charges in accordance with Section 35 of the Local Government (Finance, Plans and Reporting) Regulation 2010 will be for each area as specified in the table below. · A charge for each kilolitre of water consumed. (viz. 50% of the access charge). 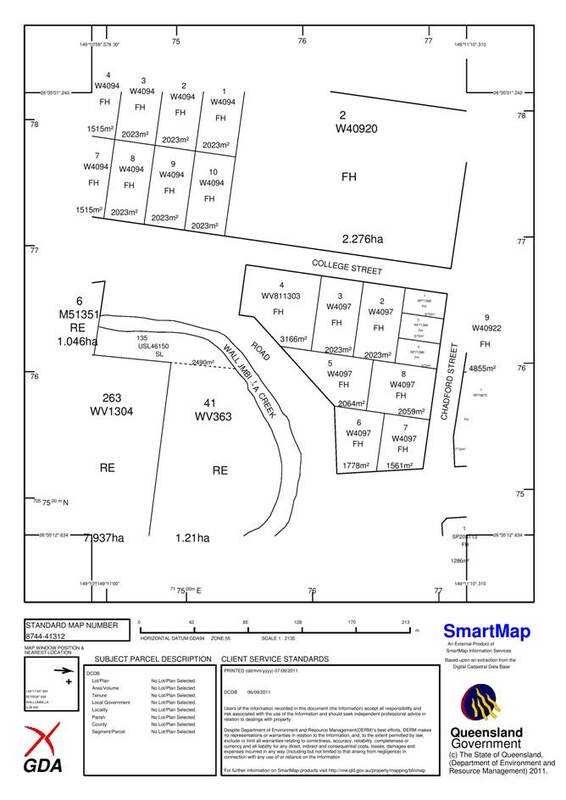 Vacant land is all land in categories with the exception of category 26 (and categories 20 & 30 in the Surat Area); upon which no building or other structure is erected and to which a water service is not connected but is within 100 metres of a water main from which council is prepared to supply water to the land. The annual access charge for each property (other than vacant land) with a 20mm water service connection shall be $344.00. The annual access charge for properties with a water service connection which exceeds 20mm will be the same proportion to the access charge as the cross sectional area of that water service connection is to the area of 20mm water service connection, as indicated in the table below (i.e. supply volume 20mm equivalents). A consumption charge will apply of $0.65 per kilolitre (1,000 litres) for each kilolitre of water consumed. The annual fixed water access charge will be levied by two half-yearly levies. These charges shall apply to all users connected to the Council water reticulation system with the exception of category 26 (and 20 & 30 in the Surat Area); for the 2011/12 financial year. Meters will be read on a half yearly basis and consumption charges will be retrospectively charged on the half yearly rate notice e.g. In the case where there is an undetected leak within the property boundaries or where a meter is found to be faulty the method of charging contained in Council’s local law for the water supply will apply. Business Premises in separate occupation or tenancy and not connected to private residence or flat. Vacant land connected to the water supply. Rural Properties including Dairy, "Dunwaitin" & "Rewfarm"
That Council levy Sewerage Charges on all property rateable or not, both vacant and occupied, that Council has or is able to provide with services together with any land that is connected to Council’s sewerage systems for the 2011/12 financial year in accordance with Section 33 of the Local Government (Finance, Plans and Reporting) Regulation 2010 and further, Council levy Cleansing Charges on all premises provided with a cleansing service. Sewerage charges for the 2011/12financial year be levied on all vacant land, which is located within 100 metres of a Council sewer main, and which Council considers is capable of being provided with a sewerage service at a rate of 50% of the annual charge for First Pedestal. Premises with septic tanks which are connected to Council’s Main will be charged 50% of the annual sewerage charge for First Pedestal. That in accordance with Section 28 of the Local Government (Finance, Plans and Reporting) Regulation 2010 and the overall plan attached (prepared in accordance with Section 28 (4). (b) Council is of the opinion that this rate will specially benefit rural lands across the region. b) For the 2011/12 financial year, Council makes a special charge of $60.00 per annum to be levied on each parcel of rateable land identified on the map for the purpose of raising revenue for the Amby Rural Fire Brigade to assist with the ongoing operation and maintenance of the service in the current or next financial years. b) For the 2011812 financial year, Council makes a special charge of $60.00 per annum to be levied on each parcel of rateable land identified on the map for the purpose of raising revenue for the Mungallala Rural Fire Brigade to assist with the ongoing operation and maintenance of the service in the current or next financial years. b) For the 2011/12 financial year, Council makes a special charge of $60.00 per annum to be levied on each parcel of rateable land identified on the map for the purpose of raising revenue for the Yuleba Rural Fire Brigade to assist with the ongoing operation and maintenance of the service in the current or next financial years. That Council levy all rates and charges in the Maranoa Regional Council in two (2) levies in accordance with Section 41 of the Local Government (Finance, Plans and Reporting) Regulation 2010. That Council require all rates to be paid within the thirty (30) days following the date of issue in accordance with Section 52 of the Local Government (Finance, Plans and Reporting) Regulation 2010. That Council allow ten per centum (10%) by way of discount on all 2011/12 general rates levied in the Maranoa Regional Council with the exception of the state fire levy, wild dog control, water charges, garbage charges, sewerage charges, excess water (Roma only), quarterly water by meter accounts, Amby Rural Fire Charge, Mungallala Rural Fire Charge and Yuleba Rural Fire Charges levied in the Maranoa Regional Council provided same are paid in full, along with any outstanding arrears, within thirty (30) days of the date of levy in accordance with Section 64 of the Local Government (Finance, Plans and Reporting) Regulation 2010. That Council levy interest at the rate of eleven (11) per centum per annum (daily compound) on all rates and charges in arrears in accordance with Section 67 of the Local Government (Finance, Plans and Reporting) Regulation 2010. That in accordance with Section 54 of the Local Government (Finance, Plans and Reporting) Regulation 2010 Council will grant an annual concession of $180.00 on rates and charges to all eligible pensioners in accordance with the conditions outlined in the Revenue Statement 2011/12. That Council adopt the 2011/12 Revenue Statement as presented in accordance with Section 104 of the Local Government Act 2009 and Section 106 of the Local Government (Finance, Plans and Reporting) Regulation 2010. That Council adopt the Borrowing Policy as presented in accordance with Section 133 of the Local Government (Finance, Plans and Reporting) Regulation 2010. That Council adopts the Miscellaneous Debt Recovery Policy as presented. That Council adopt the Internal Audit Policy as presented in accordance with Section 155 of the Local Government (Finance, Plans and Reporting) Regulation 2010 and with Section 105 of the Local Government Act 2009. That Council adopts the policy that the implementation of an Audit Committee will be required in accordance with Section 105 of the Local Government Act 2009. That Council adopt the Cost-Recovery Fees in accordance with Section 97 of the Local Government Act 2009 and that Council adopt the Commercial Fees as included in the attached Appendix. At 9.38AM there being no further business the Mayor thanked all present for their contribution and declared the Meeting closed. That Council approve the changes/additions to Client contributions to more effectively offset funding available to assist these Clients as per the Schedule below. New contribution fees should become effective from 01.10.2011 to allow time to notify our current Clients and amendments made to Service documentation. · prolonged wet weather affecting lawn growth and amount of assistance required to address the fast growth of the lawns. The combined allocated budgets for Home maintenance total $29900 per year. HACC dictates Council provide a yearly total of 857 hours of assistance for home maintenance to a yearly total of 107 Clients. This equates to $34.89 per hour of assistance. Based on yard maintenance statistics gathered from July 2010 to March 2011 the average cost of this type of assistance is $54.53 per episode of service. Clients are expected to pay a $10.00 contribution per episode leaving a shortfall of $9.64 per episode. Discussions with similar HACC Funded Services in Charleville and Chinchilla indicate our Clients are receiving more services for less Client contribution than is typically offered by these other HACC funded services. Charleville Neighbourhood Centre’s program offers yard maintenance assistance only. Their program employs a permanent yard maintenance person. Their service supplies and maintains the equipment necessary to complete the work. The Charleville service accommodates 90 Clients all of whom are charged $30.00 per month. This charge covers one mowing service per month, including removal of yard debris, however, if the Clients wish to have additional assistance they are again charged $10.00 per hour. This service is restricted to Charleville Township itself. Augathella Clients are offered assistance by way of $15.00 vouchers, which they have the option to save towards the cost of mowing their lawns which on average cost $125.00 per episode. Chinchilla’s program is auspiced by Western Downs Regional Council and is co-ordinated through the Family Support Centre. They offer yard maintenance only as other agencies within the town provide the other types of home maintenance. Yard maintenance assistance is available for 12 months of the year. The Client contribution is $11.00 per hour, and is limited to a maximum of 1 hour per episode unless otherwise negotiated. Clients are required to contact the Service when they require assistance. The Contractor collects the contribution from the Clients at the completion of the assistance and submits this to the Agency for reconciliation through Western Downs Regional Council. In compiling this report discussions have been undertaken with Melissa Wathen - Manager Social Development, Annette Gallagher – Community Care Services Co-ordinator and Jessica Law – Social Development Finance Officer, regarding the current structure of the home maintenance services and the impact of changing the current charges. It is concluded that increasing the contribution fee from the Clients will cover costs and enhance the ability for this Service to offer additional assistance. This in turn will enable this Service to better manage the impact of wet weather conditions similar to that experienced over the past 18 months, should the weather patterns persist. Review of existing HACC policy for Co-payments. Improved capacity for existing Home maintenance budget to provide more effective assistance to eligible Clients. Multiple areas have been considered in Wallumbilla and until recently have proved not suitable due to: proximity to central town area, lack of passive surveillance, security concerns, lack of existing Council services, eg rubbish bins, water, toilets and shade. A suitable site location has now been identified on College Street, Wallumbilla. Council approve the site located at the western side of Education Queensland’s netball courts on College Street currently designated as a road reserve for the location of the Wallumbilla Youth Precinct and that an application be submitted to Department of Environment and Resource Management and implement processes to facilitate the assignment of Council as trustee for said site. The Wallumbilla Youth Precinct site has still not been finalised, although recent negotiations have been undertaken with Queensland Police Service staff. Inspector Roger Whyte, Inspector of the Roma Police District is still receptive to discussions with Council staff to secure a portion of the police land in Wallumbilla, but has indicated that the process will be a lengthy one (12 months or more). An extension for the youth precinct funding has been gained from Department of Sport and Recreation staff until 31 December, 2011, for the completion of the Wallumbilla skate park. No further extensions will be granted, emphasising the need for an alternate site to be identified, so construction of the slab and installation of the equipment can be completed. Of the 20 local residents present at the meeting, all were in favour of the new proposed location. Discussions have been held with DERM staff and they have indicated that it is possible to survey a section of the road reserve and change the use of the surveyed section to recreational reserve. This will incur surveying fees, but will not attract any other annual fees or rates. Council would become the trustee for this parcel of land. Should Council endorse the recommended site being the preferred location, DERM have requested Council submit an accompanying letter, with the appropriate application form, of which there are no costs involved. The placement of the youth precinct at the proposed position, will allow pertinent connectivity with the walking/cycling trail loop and placement of the outdoor fitness equipment along the Wallumbilla Creek, with easy access back to the town centre. Funded project with a set deadline (31 December 2011), no extension of time for the project will be granted, with funded monies needing to be returned if not fully expended by the abovementioned deadline. That Council approve the demolition of the caretaker’s cottage at the Mitchell Showgrounds and use of the site for SES facility. The former caretaker’s cottage at the Mitchell Showgrounds has been deemed unfit for habitation. The cottage does not have bathroom amenities and past tenants have been required to use the public toilet facilities at the showgrounds. More recently the cottage has been found to have significant termite damage. 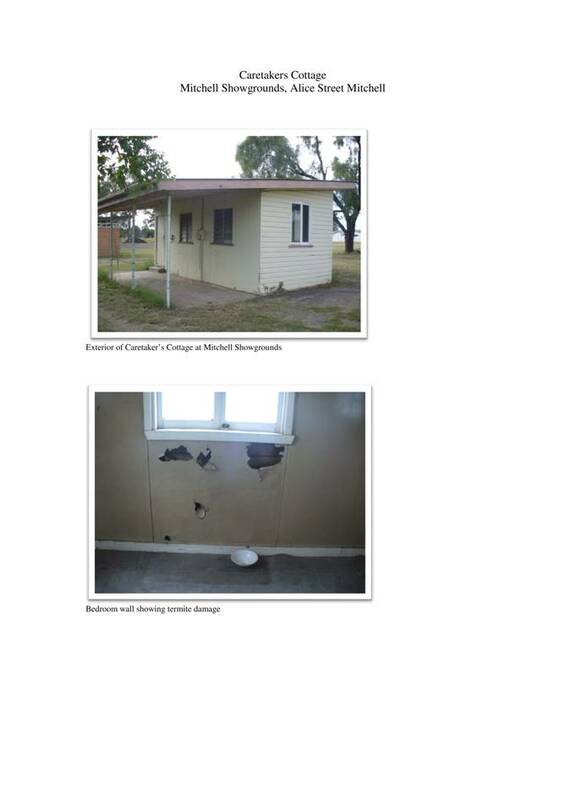 Council’s housing unit moved the most recent tenant of the building earlier this year on the basis that the cottage is not safe for habitation. The cottage has not been used for the purpose of housing a showgrounds caretaker for many years. 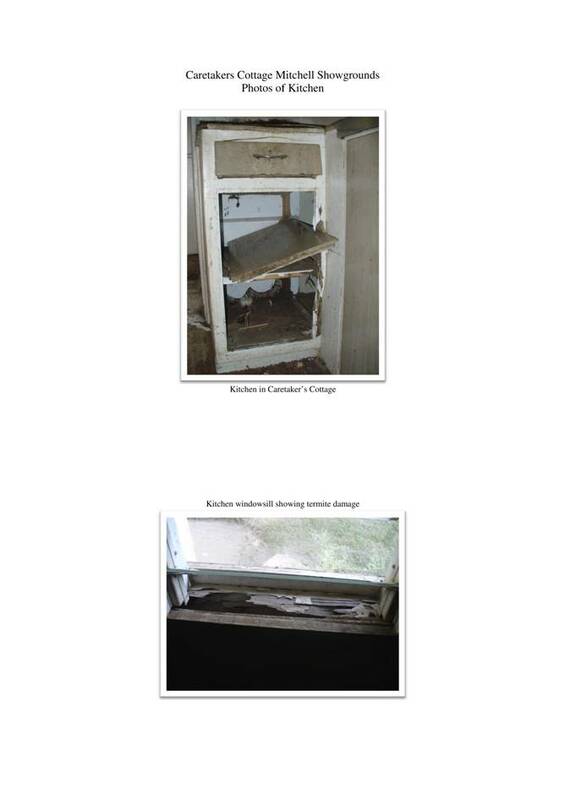 Photos of the cottage showing its current situation are attached for Councillor’s information and consideration. A quote of $1,942 has been received to treat the termite infestation. In addition to this cost will be substantial building costs to bring the building to a suitable standard for rental including an extension to allow for construction of bathroom amenities. The site of the cottage has been identified as the most suitable site for the construction of the proposed Mitchell SES Building. A quotation to construct the SES building has been accepted, and it is now urgent that the cottage be demolished to clear the site for the new building. Council’s permission is sought to demolish the former caretaker’s cottage at the Mitchell Showgrounds. Matthew McGoldrick, Director Corporate Services. The building has experienced significant termite damage and is not fit for habitation. An assessment by the community housing team of the benefits of renovation verses demolition has resulted in a recommendation to demolish the building. Demolition of this building will allow the Mitchell SES accommodation project to proceed on this site. $120,000 has been allocated in the budget to construct the new Mitchell SES facility, being funding received from the Queensland Department of Community Safety though Emergency Management Queensland. This funding did not include demolition of an existing building and therefore Council will need to fund this cost from general revenue. That Council opt in for exploration Restricted Area (RA 384) for all towns (as listed in the body of the report) within the Maranoa Regional Council area, including those with a population of less than 1000, to prevent exploration encroaching on populated areas. The Queensland Government has announced that no new land will be released for coal seam gas exploration over urban areas within RA 384 while the restricted area is in place. In addition, existing coal seam gas exploration tenure holders will be requested to relinquish areas from their exploration tenure that are in and around urban areas. Towns covered by the restriction are automatically included unless Council decides to opt out. Councils that have towns with a population of less than 1000 people may also opt in. The population of 1000 for a town has been chosen as it is the smallest population the Australian Bureau of Statistics uses as an identified urban centre. Local governments have until 16th September to opt in or out of the Restricted Area 384 – and a majority vote of the Council is required. Exploration encroaching on populated areas. CT Management will be in Roma on 12 September to conduct a session with council’s Directors to determine progress on Asset Management Plans and update our report card. Asset Management Plans are progressing with assistance from asset owners. The commencement of a GIS officer and GIS administration officer will greatly assist in verifying asset existence, conditions and location over the next twelve months. Engeny have received the ALS data from Department Environment and Resource Management and modelling of flooding events is progressing well. The Mitchell Bore Replacement Tender Update – Pipe and Equipment has arrived in Mitchell for the Bores. The switchboards have been built and tested and should arrive shortly. Telemetry for the sites is being designed. Stage 2 of the Roma Sewer Main relining program is completed. The CCTV and Cleaning component and the relining component are complete. The jump up relining (Tiger Tails) is complete. The CCTV report is on its way. The Wallumbilla bore contract is progressing well. The analysis report from John Hiller (Hydrologist) for the correct pumping depth to be set for our desired 16l/s flow rate has been received. The Bore Pump Spec will be ready to call quotes on by the 13th September. The Fluoridation Concept report draft has been completed and submitted. The final version of the Regional Urban Water Management Plan and Supporting Information CD has been received. The final report and Claim for $ 8,000 has been submitted to Canberra. The Final Report for the Maranoa Regional Council Water Saving Initiatives Program (Injune & Roma STP Reuse Projects) has been completed and a claim for $24,500 has been submitted to Canberra now the project is complete. The Automatic Chlorinator/Analyser Installation for the 3.2 Ml reservoir, located on the corner of Bowen Street and Whip Street is 90% complete. Once the correct manifold arrives MRC will be commissioning the site. A 200 Kva Backup Trailer mounted Generator has been ordered ($75,333.50) as per stage 2 of the Raw water reuse project which is 40% subsidised by DIP. To facilitate construction of the terminal, public carpark and also the runway overlay works, a second access has been constructed into the Roma Aerodrome site. This will allow the travelling public to enter the site safely and easily, while construction traffic utilises Airport Drive until December 2011. These changed traffic conditions continue to remain in place. Numerous operational and maintenance manuals / procedures, approvals, certificates and safe work method statements will need to be completed / attained through the months of January 2012 to 1st July 2012 to achieve compliance with OTS regulations and acts. Construction of the new Public Carpark at the Roma Aerodrome is progressing. Underground services for lighting and communications have been placed throughout the carpark per design. Wet weather delays have resulted in completion of the sub-base gravel formation works now planned for the 9th September 2011 with kerb construction planned to commence on the 12th September 2011. Final base layer gravel pavement placement is planned to commence on the 29th September 2011 with asphalt placement for the carpark planned to commence on the 7th October 2011. Practical Completion is now estimated to occur on the 14th November 2011. Lighting installation and cabling will then occur along with testing and commissioning on this component of the works. All concrete pour works for the Terminal building slab have been completed. Structural steelwork is currently being erected with approximately 1/3 of the Spantech curved roof system currently installed. The remainder of the Spantech curved roof is planned to be completed by the 19th September 2011. Currently, Practical Completion of the terminal building “shell” is expected to occur on the 24th November 2011. Internal fitout will then commence through December with commissioning and testing estimated to occur through January 2012. Formal opening and commencement of operations from the new terminal building is set for mid February 2012. The formal opening will see the dedication of the new terminal building to A.T.Berry. The new terminal will be signed Roma Airport – with signage mounted on the roof. This is in keeping with naming practices for other airport terminal facilities (ie. Emerald Airport, Toowoomba Airport, Rockhampton Airport, etc). Fulton Hogan have completed the runway asphalt surfacing works. Completion occurred on the 1st September 2011. New linemarking has been applied to code. A six week stand-down period now applies while we await a response from communications with the Bureau of Meteorology in relation to the relocation of the weather station. Once this equipment has been relocated, Town & Country Industries will be able to complete the apron extension gravel pavement formation works to enable Fulton Hogan to apply the asphalt surfacing to this area of the site. The remainder of the RPT Taxiway will then be completed followed by asphalt surfacing to the public carpark per design. Design for the new Dash8-400 series apron is complete. It is planned that the first stage of the apron works will be carried out during the 10th and 11th of September as night works for a 26 hour continuous work shift. This work will ensure disruption to QantasLink flights and to normal operations at the site are kept to a minimum. Following completion of these works, Stage 2 will see the remainder of the apron works completed - assuming cooperation by the Bureau of Meteorology. Currently, minor taxiway light relocation works along with electrical service relocation works are underway to facilitate construction of the apron. Contract expenditure during the first two months of 2011/12 has been relatively consistent with original forecasts. Recent staff changes have had an impact on the continuity and completion of some tasks, however progress continues to be made in getting on top of issues. Drainage and clearing works on Roma-Injune and Roma-Taroom Roads has ceased, at the direction of TMR, until funding for this work can be finalised. § Mitchell-St George Rd widening work primer sealed. § Repairs being carried out at World’s End Ck on Forestvale Road. § Re-submission of Invitation to Offer Documents for 2011/12 RMPC Contract. § Meeting with TMR and Maude Kearns, held concerning the clearing and cultural heritage issue on Mitchell-St George Rd. § Heavy shoulder grading planned for Surat St George Rd, Surat Tara Rd, Surat Roma Rd, Roma Southern Rd and Roma Injune Rd. § Routine road maintenance such as pothole patching, herbicide spraying and slashing consistent with the August 2011 backlog list. § Revision of Quality Construction, Environmental Management, and Construction Safety Plans being used as part of the 2011/12 RMPC contract. All TMR emergent flood damage works have been carried out. Minor work undertaken on Roma Taroom Rd under restoration flood damage. § Completion of stabilisation section at Slate Hill on Roma Taroom Rd. § Meeting with TMR to discuss upcoming work on Mitchell St George Rd and Surat Tara Rd. § All gravel is placed. § All lots have been primer sealed. § Project complete except for final bitumen seal. Project in pre-construction phase. Materials and contract documentation being prepared prior to the commencement of works. No progress since last month. § Issues with Quality Construction Plan, Environmental Management Plan and Construction Safety Plan are currently being addressed and will be re-submitted to TMR for final approval. Flood damaged Council infrastructure reconstruction work. An additional submission has been completed and submitted for approval under Event 1 (Jan – April 2010) during the period. The amount of this submission is $3M, and this is the fourth submission made under this event. A submission for Event 2 (Nov 2010 – Feb 2011) $14M, and Event 3 (April 2011) $6.5M is currently being finalised and is expected to be completed in September. Gravel resheeting and heavy formation grading is continuing throughout the region as well as various other activities including pavement stabilisation. § Interviews for the vacant position of Project Officer – Flood Recovery have recently been held with the position now filled. § Gravel crushing contractor has commenced work. § Roadtek construction crew engaged. § Completion of two additional submissions (total value $20.5M). § Engagement of additional contractors. · Please see attached document.